The question is, why Kilimanjaro? Well, this is the story of a week full of fun, worries, fatigue, satisfaction, joy and happiness. 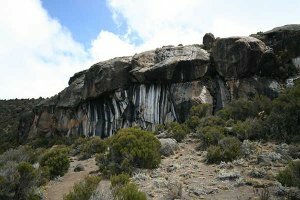 Selected the goal – Uhuru Peal, 5’895 m, 19.340 ft – has to be chosen the way, Marangu Route, six days, from 11th to 16th August 2016. Let’s go! Thursday, August, 11th 2016: the small pick-up fully loaded with people, backpacks, potatoes, flour, chickens, water, gas cylinder and various “lunch boxes”, leaves you at the Marangu Route Gate. THE entrance. Completed the formalities, the climb starts! Way to Camp 1 – Mandara Hut, 2’720m, 8.923ft. The path is in the middle of the forest and the animals met during the hike, instead of the typical marmots, chamois and alpine ibex, are monkeys, not exactly an Alpine environment! Along the path it is easy to see blue and white monkeys that are watching you going “pole pole” (slow slow in Swahili) towards Camp 1. The first day is quite easy and after 3 hour and 8,2 km with 827D+, the Mandara Hut is in front of you. The dinner is prepared by the cook and in the meantime you can exchange experiences with other climbers sharing this adventure. This hut is also the last point on the way back thus it is possible to talk with other climbers that reached the summit (or tried to do so) the days before. After dinner and a small tour in the surroundings, make a deep sleep in the sleeping bag. The animal noises are quite disturbing and strange, hopefully the heavy door between the cot and the jungle will do his duty! Turn off the front lamp and take a rest for the next day. Friday, August, 12th 2016: after breakfast at 7:43am ready to leave for Camp 2 – Horombo Hut, 3’750m, 12.303ft. The forest leave the place to Kilimanjaro’s moor land. From here it is possible to glimpse the Kilimanjaro’s peak (based on the weather conditions) and the Mawenzi’s peak (5’149m, 16.893ft, peak). After 5 hours, 14,4 km with 1’030D+, Horombo Hut is reached. Signed the guest book it is time to rest before the snack made of popcorns and chocolate biscuits. This place is one of the most panoramic view of the whole valley and mountain peaks, thus, a small tour in the neighborhoods with the camera is well recommended. After a dinner very early it is time to go to bed since the hard days are coming. Saturday, August 13th 2016: acclimatization day. From Horombo Hut the final destination is “The Saddle” passing through Zebra Rock above the fateful 4’000m, 13.123ft. As mutually agreed with the guide, after Zebra Rock we proceeded towards “The Saddle” at 4’350m, 14.271ft. The landscape from this point is unforgettable. Kilimanjaro in front of you, Mawenzi on the right side and alpine desert surrounding everything. Yeah! From the top of The Saddle there is also the possibility to see Camp 3, Kibo Hut at 4’750m, 15.583ft. After 4 hours, 11,3 km and 853D+ the Camp 2 is already in front of you. This day is, in my opinion, fundamental for the right acclimatization to reach the summit. Sunday, August 14th 2016: from here onwards there is no longer time to joke. There is only the time to go up, climb, take the summit and come back home. 8:15 am, breakfast done, let’s go for Camp 3 – Kibo Hut, 4’750m, 15.583ft. Alpine desert above 4’000m, after passing a sign “The last water point”, you are in the middle of “The Saddle”. It is an immense plateau pointing the Kilimanjaro’s summit. The peak is always in front of you during all the climb and you can see it, seems that you can even touch it, but it is quite far, yet. Lunch at 4’400m, 14.435ft and then let’s climb again. The hike takes about 6 hours, 10,1 km and 1’231D+. At these altitudes, each single effort is difficult and the fatigue of the past days start to appears. Reached Kibo Hut under a beautiful sun around 2 pm, it is mandatory to rest before the tea with biscuits and the inevitable popcorns. Due to the altitude, the dinner is quite light since you are usually not so hungry, anyway, the best thing is to rest a little bit since few hours later the fight for the summit began! Monday, August 15th 2016: 00:14am, “only” 1’200D+ to the summit but a lot of obstacles have to be undergo, one for all, you limits, worries and thoughts. Turn on the front lamp and everything starts. A journey that will change you and your mountain experience. Everything starts at 4’810m, 15.780ft, a symbolic altitude for people, like me, living in the Alps, since it is the highest point in the Alps, the Monte Bianco summit. The climb start to became quite difficult specially because the thin air at these altitudes. The starry austral night is watching you. The legs and breath are ok, 5’000…5’400…5’685m, 18.651ft, Gilman’s Point, first crucial point, reached after a huge and very long ramp of about 1000D+ in only 3 km. What to do right now? This is the last point to go down and give up if you want. Let’s go, go up a little bit and see what will happen. 5’756m, 18.884ft, Stella Point, reached! “Only” 150D+ to the summit, everything is dark, but move on and proceed toward the summit. 7:23am, summit, Kilimanjaro’s peak at 5’895m, 19.340ft, the highest African’s peak, one of the glorious Seven Summit. 6km, 1’447D+, a huge ramp that ends at the Uhuru Peak. The sunrise from the summit is unforgettable, like the glaciers at the top. You are just in the middle of this long day but the sensations at the top, even with the tiredness, are amazing. After the same route, Kibo Hut is again reached and, after a quick lunch, let’s go down to Horombo Hut. 15 hours hike with 20,6km, 1’617D+ always above 5’000m. At Horombo the tiredness takes over and it is time to rest remembering the wonders seen just few hours ago. Tuesday, August 16th 2016: from Horombo Hut down to Marangu Gate with a small deviation to see the Maundi crater at 2’772m, 9.094ft. Another 21km with 317D+ enjoying the path and the landscape. After 6 hours it is time to pass again the Marangu Gate and take the summit certificate. 85,6 km in total, 5’921D+ in 4 days, 23 hours and 56 seconds hike. Uhuru Peak at 5’895m, 19.340ft. The question is, why Kilimanjaro? Because this was WONDERFUL.